Preceding and preparing for a regular medical course of study, as a premedical education. A drug used for premedication. 1. To think about a situation before jumping into it: Prior to going on their trip the following week, the Curtis family had been premeditating about what they needed to take with them. 2. To plan, to arrange, or to plot an illegal act in advance: Henry was convicted of having premeditated the robbery long before he actually committed the crime. 3. 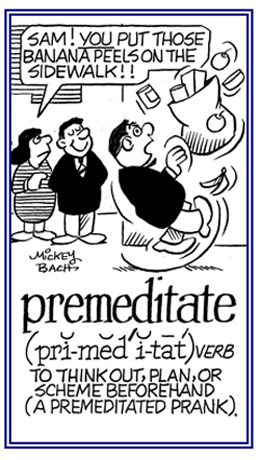 Etymology: possibly from Latin praemediatus, "deliberate, composed or planned beforehand" from prae-, "before" + meditari, "to consider, to think about". © ALL rights are reserved. 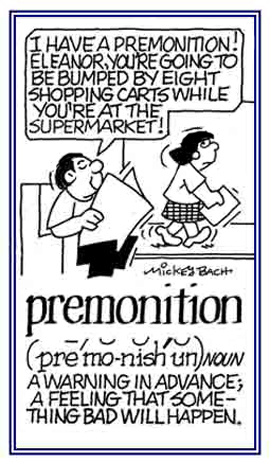 That which is considered beforehand and appears mostly in criminal-law contexts: Because the term premeditated so often precedes a bad legal act of some kind, as in a premeditated murder, the word has taken on very negative connotations. A speculation or an arrangement of something in advance: Hector's murderous attack on the family obviously was a premeditation which he had planned long before it took place. The period immediately preceding a menstrual period. To merit or deserve beforehand. 1. To state or to assume something as a pre-existing during an argument: Henry premised his speech with the idea that everyone wants to have a job and to be able to take care of themselves economically. Sam, do you mean to premise that the bank lied to us about the amount of funds in our account? 2. To provide an explanation before the main contents: The author premised his readers with an introductory note to explain the purpose of his book. 3. Etymology: from Latin praemittere "to send or to put before"; from prae-, "before" + mittere, "to send". 1. A proposition upon which an argument is based or from which a conclusion is drawn: Max disagreed with May's premise that the rainstorm would keep them from being able to go to school. 2. A statement in advance as an introduction or an explanation: Since Mark fell down and got his clothing all muddy, his premise to his mother justified his reason for returning home instead of going to see the movie. 3. 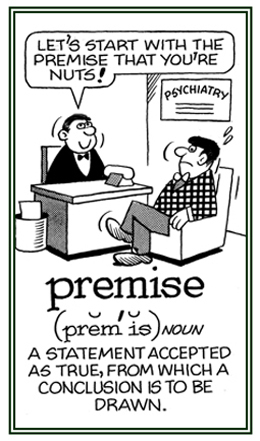 Etymology: from Latin, praemittere, "to set in front"; prae- or pre-, "before" + mittere, "to send". © ALL rights are reserved. 1. A forewarning; a prior warning or notification: Jack remembers that before the earthquake took place, his two dogs were restless and greatly disturbed; as if, they had premonitions that the shaking of the area was about to happen. 2. A feeling about a situation or an event before it takes place: Martin Luther King presented a speech consisting of premonitions of his death just days before he was murdered in 1968. © ALL rights are reserved. Occurring before the development of the signs or symptoms of a disease. 1. Terminated abruptly, or as if something were bitten off. 2. Abruptly truncated, as though bitten or broken off. Taking place or performed before death; an antonym of post-mortem. Someone who is about to die; just before death. Showing page 11 out of 19 pages of 275 main-word entries or main-word-entry groups.